Q. We have a hedge of small evergreen cedar trees that were badly bent by the heavy snow last week. I've heard you say on your radio program that they'll gradually recover. I'm not so sure and would really like to do something to help them along. A. By "cedar trees," I'm assuming that you mean arborvitae? If you just can't resist the urge to "do something," a drill, a couple of foot long lengths of wire, and a washer can help pull your plants together in less than ten minutes per plant! First, for relatively small plants with flexible stems, drill 1/16 inch diameter holes through each of the bent stems about two-thirds of the distance from the base of the plant, toward the top. Next, insert a length of wire (20 gauge or so) through each of the holes, double the wires back on themselves on the outside of each branch, and gently pull the doubled lengths back into the holes. The double thickness of wire should wedge tightly in each hole, left. Next, insert one of the wires through the washer and twist to secure it. Now, take a wire attached to a stem on the opposite side of the plant, insert it through the washer, pull it taught until the branch is back to its normal position, then twist several times to secure it to the washer. 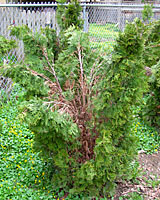 Repeating this process with each of the remaining wires, at right, will result in the stems of your arborvitae being brought back to their original orientation, below left. After a couple of months, you can remove the wires and the stems should remain upright. Or, you can leave them in place to hold the stems together during future storms - the stems will simply grow over the wires without being harmed! For larger plants, you'll want to drill a larger hole - maybe 3/16 inch - and use a heavier gauge wire. While this is a pretty simple and effective technique, I need to stress two points. First, if the above process seems to be too tedious, do not simply wrap wire around the stems and pull them back together. Depending upon how vigorous your plants are, they could easily start to grow around the wire in a single season - which will ultimately cause their decline and death! And second, NEVER, leave the ground and attempt to do this with trees on your property! While cabling and bracing is a perfectly acceptable technique for stabilizing trees, it requires special skills and equipment. Also, when done correctly cabling and bracing is done in combination with strategic pruning to reduce the weight that the system must support.